Ultra Offloading Shoe Darco Please check replacement CLICK BELOW!!! 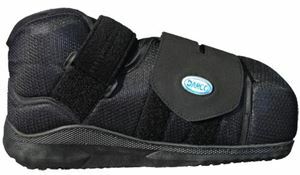 Ultra offloading shoe by Medline Canada is designed to use on post operation in the healing process. Features a closed-toe box design that can easily accomodate bulky dressings amd helps in keeping toes dry throughout the wear. Made up of Nylon material. Forefoot closure can be removed/reversed for extra security. The material that the shoe is made of is very soft and the best thing is that you can order from the list of several sizes. It easily accommodates bulky dressings. Worth a try! !